A friend of mine recently wrote a post over on XOJane entitled ‘When Activism Gives Way to Advertising: How Fatshion Blogging Ate Itself’ (she didn’t pick the title, but the pun makes me lol childishly). In it, she describes feeling alienated from the fatshion blogging world and how it has also been saturated by the culture of capitalism and advertising and leaves little room for her type of activism. Natalie makes some very salient points and I feel this is a discussion that has been a long time coming in the fatshion blogging world. Some fatshion bloggers don’t identify as activists and that’s fine — not everyone has to. The article isn’t condemning those who don’t. However, some argue that the very nature of their putting photographs out on the internet, on their blog and sharing them around, making their fat bodies visible, is an inherent act of activism. Just because it’s not overt does not mean that it isn’t challenging dominant think. This is a viewpoint I do agree with. I think the only way to normalise fat bodies is to constantly be exposed to them, and fatshion blogs provide an easy exposure. I certainly got started in fat activism by finding fat people’s fashion blogs and realising that I, too, can dress fa(t)shionably even though I’m not slim or have the resources for designer clothing. Natalie brings up something I agree with entirely – the relationship between bloggers in general and their sponsors/advertisers/gifters. Not everyone monetises their blog, nor can they. And her post isn’t a judgement on those who do. But a comment I read on her post got me to thinking about “brand relationships” and “honesty” in blogging. The person said that they didn’t trust YouTube makeup bloggers anymore because of how large the industry has gotten, and because those bloggers are sent out so much free stuff, they weren’t sure whether the blogger was being honest in their opinion of the makeup they were talking about, or if they were told to talk up the makeup they were blogging about by the brand that sent it out to them. After all, they got it for free, so they should be grateful, right? And be careful about saying anything bad about the product because it was free. This is something I’m acutely aware of over at my other blog. I don’t have advertising on it because I don’t like the look of it. I also prefer to only talk about brands and products that I have personally tried, and if I am sent something for free, I will be transparent about that and be completely honest in my opinion of the product. 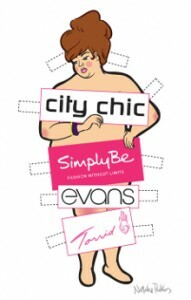 I don’t believe there is anything wrong with having a brand relationship, particularly being a plus sized blogger. Fat women have been left out of the fashion industry for so long, that finally getting some recognition, even if it is in the form of free stuff, is something I can’t begrudge. I think we all have our corners of the internet to talk about whatever concerns us and where we can practice our activism. Just because someone doesn’t do it somewhere doesn’t mean they aren’t doing it elsewhere. This point was one that needed to be raised and I’m glad Natalie did. I’m interested in reading the responses and discussions that her article received. We need to keep talking about it. This entry was posted in Fashion, Opinion and tagged activism, blogging, capitalism, fashion, fatshion, Opinion. Bookmark the permalink.